Who's the law? You are! Beautiful copper pieces with cherry creek jasper and loads of fun beads. Wait 'til you try this one on! $88. Orangey carnelian with (possibly faux) turquoise and a bronze pendant showing a crazy scene. Shouldn't we all glow from within? This glowing example will be your reminder. 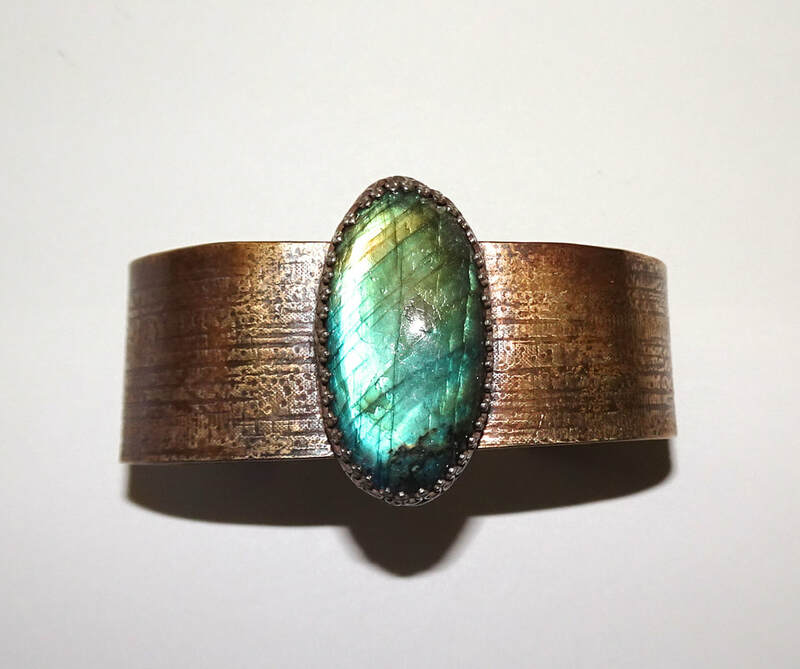 The stone is Labradorite with sterling silver on a brass textured bracelet. Glow! $85. No, not for sale. This necklace is in my personal collection but I just had to be a show off! The amber is actually faux, made by me with polymer clay. Above it are three Thai silver beads and one Thai silver barrel. But the most amazing things are the turquoise beads. They really are big and beautiful. It's all knotted on Irish Linen cord, one of my favorite stringing materials. Dangling in front of the amber is a bronze raven. If you are interested in a designer original like this, contact me and we can work on your new piece! Copper earwires with all Czech glass in blues and greens. Two "pressed" beads look like trilobites in green with an orange finish. Stolen at the Silverton Art Show along with two other pairs. Bah humbug! Yes, it's a long story that started with green and purple. Then turquoise, and carnelian. It was hard not going further as I was on fire with the colors! Natural stones, lampwork glass, charms: it's all here! The necklace is long, the pendant jiggly. I could go on, but I'll save it for the show.